Welcome to the colorful and slightly unpredictable world of artist, Kerri Rosenthal. Westport, CT (January 22, 2019) – For the first time, the colorful, stylish and unpredictable world of artist, Kerri Rosenthal will exhibit for the first time at NY Now, February 3-6, 2019, at the Jacob Javits Center in New York City. The new Kerri Rosenthal Home and Apparel collections are inspired by her popular range of art work, and until now were exclusively available in her Westport flagship and online shop. The new collection is a reflection of Kerri’s bright, artistic vision, and her innovative approach to taking the art off the canvas and creating a lifestyle brand based on her own personal style and passion for art and home design. The Kerri Rosenthal Home collection was created to fill the spaces of Kerri’s own interior design clients and includes luxurious Belgian linen pillows and custom upholstered furniture featuring her art-inspired linen fabrics. Kerri’s signed Blocks of Love feature her iconic Drippy Hearts, Flags and Words series that are encased in glossy acrylic, and the innovative Paperless Wallpaper™, created by Kerri as a fun alternative to traditional wallpaper. Always thinking how to make art more accessible, Kerri is introducing 15 x 15” square framed Plexis of some of her favorite original paintings including the iconic Drippy Heart and Word series. 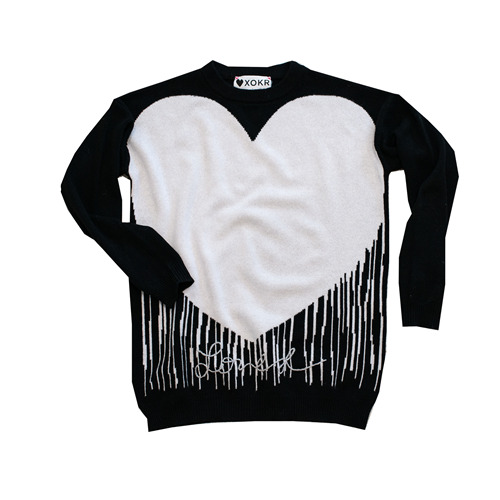 The Kerri Rosenthal Apparel collection includes oversized and overly comfortable Loved Cashmere sweaters, and lived-in Vintage tees and sweatshirts, featuring Kerri’s iconic Drippy Heart and Flag series. 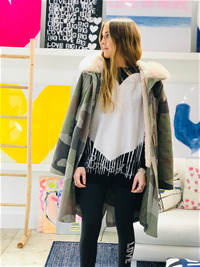 Kerri is Founder and Creative Director of Kerri Rosenthal, a fresh and modern style brand that seamlessly takes the art off the canvas and into daily life. Kerri brings her effervescent energy, love of color and pattern and her innate sense of style to everything she creates. A colorful expression of her life and loves, Kerri’s highly regarded artwork includes her signature Drippy Hearts and Word series as well as her colorful flags, Tikis, Biblioteque series, emphasizing her love of books, and her photography and abstract series. For more information, visit www.kerrirosenthal.com. NY NOW is the premier specialty trade show and marketplace, featuring over 4500 exhibitors from all 50 states and over 90 countries and is known as the leading market for home and lifestyle products. Kerri Rosenthal's iconic Drippy Heart on Cashmere - it's a match made in a very stylish and cozy heaven. Our new 2019 LOVED Cashmere Sweaters have arrived in three new exciting color combinations including Grey and Cream, Bubblegum and Sunflower and Carbon and Chalk. Classic combinations also available, including Cream and Indigo, Cream and Pop Pink and Oatmeal and Sunflower.